Pop quiz: Does your company value financial performance, innovation, and tapping into new markets? Here’s a hint: The answer should be yes for at least one of these points,if not all of them! And if that’s the case, you’ll want to think about how you can actively promote diversity and inclusion, since more diverse companies have been shown to outperform less diverse peers on all those dimensions (and more—check out some of the most impressive statistics on diversity and inclusion here). There’s no way to build a more diverse and inclusive organization without switching up your recruiting strategy to attract a broader pool of candidates. And employer brand plays a huge part in that—77% of talent acquisition managers agree that their employer brand has a significant impact on their ability to hire great talent. Think of it this way: Employees need to be able to see themselves at your company in order to feel comfortable applying there. But if your employer brand isn’t currently telling that story, don’t panic. It won’t be an overnight process, but there are a number of things you can do to build and promote an employer brand that supports diversity recruiting. Let’s take a look at some of them. Start with your employees—without their buy-in and support, it will be impossible to build a culture of inclusion and establish your employer brand. Your recruiting team can promote diversity and inclusion initiatives among employees and identify allies and partners who will get involved and help spread the word. Regularly check out employee review sites like Glassdoor, request feedback from candidates after interviews, and ask to view employee survey results. Consider how the employee and candidate experiences your company creates are affecting your recruitment efforts, and work to make necessary changes—even if that means escalating the feedback to your leadership team. If your company has employees dedicated to diversity initiatives, meet regularly to discuss goals, progress, strategies, and challenges. This will provide a forum to consider ideas for improvement, both within the recruiting function and throughout the rest of the organization. It will also ensure that you are aligning your efforts with diversity and inclusion leaders. Hold company-wide events that discuss why you’re prioritizing diversity and inclusion, what you’re doing in those areas, and share the progress you’ve made as an organization. Join employee resource group meetings to learn what you’re doing well and where you can improve. If you find that certain groups are underrepresented in specific departments, work with the leaders of those departments to uncover the forces and processes that have contributed to that reality. Then develop strategies to address these areas. Publicly promote and applaud recruiting and hiring behaviors that further diversity recruitment. You should also publicly address behavior that hurts your diversity recruiting efforts and provide one-on-one training to correct it. Doing so will keep your company’s diversity and inclusion initiatives top of mind for all employees while creating room for growth and improvement. If your company has made progress toward a diverse and inclusive workplace, make sure it’s communicated across all of your recruitment materials. If you’re just beginning your D&I efforts, be honest about where your company stands and the efforts you’re making to improve, however imperfect they may be. Look at your employer branding materials with a diversity and inclusion lens to ensure they’re appealing to different kinds of people. Use the data you’ve collected from your employees about why they like working for your company to highlight why your employees are happy, and be intentional with the language you use to describe your company and open roles. Here are a few ways you can promote your employer brand to the outside world. Rather than using stock images throughout your career site, use real photos of your team. Include employee testimonials throughout that tell candidates why your company has been a great place to work for them. Check out the screenshots below from Lyft to see some real-life examples. Lyft uses their careers page to share photos and stories from real employees. Highlight employee benefits and perks, but make sure that they are appealing to diverse groups of candidates. For example, free beer and a quarterly trip to Tahoe will appeal to a different group than a generous family leave policy and a matched 401k plan. 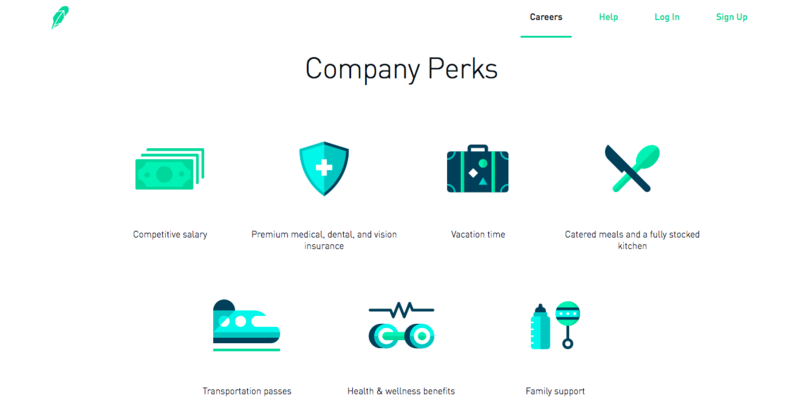 Here’s an example of how Robinhood shares various employee benefits on their careers page. Your employer blog is a great opportunity to share stories about the work you’re doing to build a diverse and inclusive workplace. It is also the place to share how your company is engaging and partnering with different communities. Use these stories to show how individuals of different backgrounds can grow and make an impact on their communities by joining your organization. Give customers and candidates alike a behind-the-scenes view of your company. Share photos of events, employee resource group meetings, or a “day-in-the-life” of an employee. Encourage your workforce to engage with your social media posts, and to create their own content about life at your company. Greenhouse uses Instagram to share photos of company fun days, bobble heads that are made to commemorate employee anniversaries, and other quirky aspects of their company culture. Your employer brand is made up of the stories you tell as a company as well as the stories your employees and candidates share based on their experiences. By taking the time to include a broader spectrum of stories, you’re showing your current and future employees that diversity and inclusion are priorities for you. We’ve shown you just a few ways that you can begin to weave these stories into your employer branding narrative, but we encourage you to continue looking for ways to do this. Remember: the time and effort you put into building a diverse organization will pay off in a number of ways in the future. Explore the topics of employer branding and diversity recruiting in more detail in our eBook, “3 Diversity Recruiting Strategies.” Download your copy here!